It happened earlier this month on Mission Street, in a Sons of Italy outpost promising reasonable rates for its hall of mirrors. There, speaker after speaker excoriated the deplorable state of San Francisco’s public schools, particularly for black and Latino students, and lauded the work of charter schools, which were described as “our private educational institutions” by an African American clergyman. Ayres, by the way, is not reflexively anti-charter school; her kids go to a charter school here in the city. But the level of rancor and fervency she encountered that night left her uneasy. The event was sponsored by Innovate Public Schools, and Ayres and multiple other attendees said this anodyne name gave them little notion of what was to come. “Innovate” is one of the most ubiquitous words tossed around regarding the educational system; several attendees told Mission Local they assumed this was a district-sponsored event. Prior to turning its eyes to the north, Innovate won contentious battles in the San Jose area, besting opponents claiming that charter schools are cannibalizing the public system. They began quietly cultivating black and Latino parents in the Bayview and Mission two years ago, but it’s only in the last several months that this has garnered much attention. The organization began saturating area residents’ social media feeds with links to its report claiming San Francisco schools are the very worst in all of California for poor students of color. Innovate’s report is titled, “A Dream Deferred,” a Langston Hughes reference lost on few. Also lost on few is the exquisite quality of this document’s online form, which allows readers ample opportunity to share it with elected officials — and share their personal data with Innovate — at the push of a button. Innovate’s most recent tax forms indicate it grossed more than $4 million in 2015 alone, and its slick materials, excellent website, and a communications staff dwarfing the San Francisco Unified School District’s are indicative of that. But, here in San Francisco, Innovate is also operating like a much leaner — and meaner — operation. Last month, Innovate trumpeted on social media that it would be holding a “Parents’ Research Meeting” at Everett Middle School in the Mission. The announcement stated that assistant superintendent Tony Payne, who oversees San Francisco’s Mission-area schools, and Fernando Nunez, the director of the multilingual pathways department, would be present. Attendees were informed that parking was available in the school’s lot. And yet, Everett staff — including its principal — had no idea who this group was; they didn’t even know this meeting was taking place. The school’s facilities manager confirmed that nobody asked him if they could park on school property. An attendee of that meeting says it consisted of a woman describing herself as an “organizer” handing a script to parents, who then read questions to Payne. Nunez did not attend, and Payne did not return our calls; it is unclear if he knew who he was meeting with. But he certainly knows now: the glossy report indicating this city’s students of color fare worse than any others in the state was also liberally referenced and disseminated. Innovate gave that report at its coming-out party at an October City Hall rally. But, despite the announced presence of individual NAACP members, both the state and national NAACP have, rather unambiguously, called for a moratorium on charter schools. Nonetheless, Innovate has disseminated promotional material liberally excerpting criticisms of San Francisco schools from the Rev. Amos Brown, the head of the local branch of the NAACP. That flier urges concerned readers to send a text message that both funnels them into an Innovate database and transmits Innovate’s “Children First Pledge” to city officials. Brown is less than thrilled about being enlisted in this effort. Mission Local has heard many such stories: Innovate staff packing public meetings and clapping and shouting at the right times; Innovate employees crashing seminars intended for parents, participating in them, and scouting for recruits; Innovate staff trying to gain entry into community organizations. These are tactics more befitting campus Marxists or Lyndon LaRouche acolytes than a multi-million-dollar nonprofit with dozens of employees and a coterie of extremely wealthy backers. But the strategies employed by scrappy ideological groups do work — and can be even more effective when you have big bucks on-hand to pay professional organizers. Innovate’s critics have accused it of being an “astroturfing” operation — a purveyor of phony grass-roots support named for the plastic grass once ubiquitous on indoor sports fields. But this accusation misses the point: Whatever one thinks of Innovate’s agenda, the intensity and potency of its organizing is not up for debate. Put succinctly: These people are organized. In fact, they’re hiring lots more organizers. 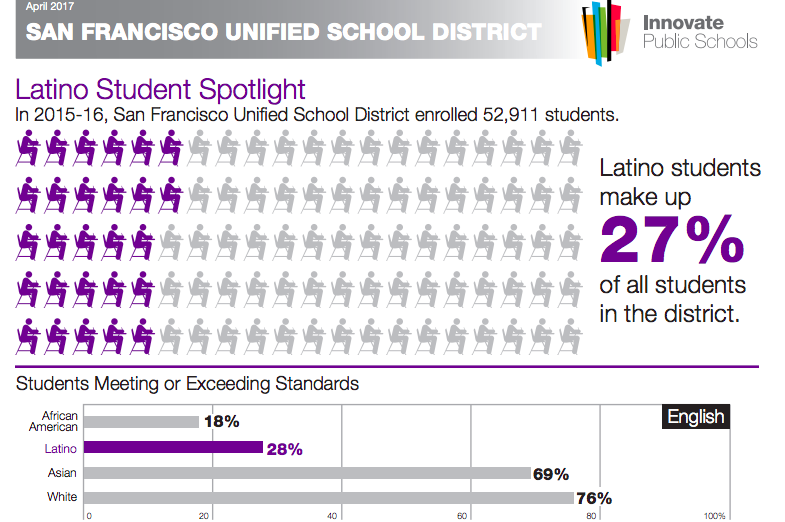 Innovate’s damning report about this city’s achievement gap isn’t just visually stunning. It’s also plausible. This city’s failure of its minority communities is not an abstract concept for the parents who attend Innovate rallies and grab the microphone. Innovate founder and CEO Matt Hammer bristles at the notion that the black and Latino parents — and churches — working with his organization and serving as its public face are being paid off. Their concern is real. Their fear and anger are justified. It also happens to dovetail with the agenda of a Silicon Valley nonprofit that happens to be funded by big-money players who can be credibly accused of attempting to unmake the public education system. Academics, meanwhile, are unimpressed with the actual substance of Innovate’s findings. The test being used as a cudgel by Innovate, the Smarter Balanced Assessment Consortium (SBAC), has come under fire as a broken and unreliable measure of student performance. San Jose State professor Roxana Marachi is one of more than 100 education researchers who has called for this exam to be junked. Among myriad complaints, she claims the test is riddled with “technological glitches” that render it far from “standardized.” The SBAC, she continues, is “designed so that 70 percent of those taking it fail,” and performance is correlated to family income to an uncanny degree. Hammer tells me that charter schools are “just a piece of the puzzle,” and that, despite years of effort sowing (even more) rancor with the district, he wants San Francisco Unified to succeed, not fail. The CEO adds that he has “amazing people on my team” who’ve offered to help the school district start up “amazing district public schools.” Amazingly, no one from the district has gotten back to him on that. Hammer’s group emphasizes accountability — an element that is sorely lacking in all corners of San Francisco government. But accountability works both ways. If Innovate really is about empowering the poor families of color and improving existing schools — and not just about serving the “charter schools uber alles” mantra of its donors — we will all be here to take note of it. School may be out. But this isn’t over. Time to cut the pensions from retired teachers. That money should be going to educate the current students. The teachers union needs to put the children first. Trump needs to come out and tell all retired teachers that he’s sorry but the checks starting January 1st 2018 needs to go to current teachers and current students. Retired teachers screwed the children. Shame on them. Focus on education and not $. cut the pensions? no, they payed into the pension and it was deferred compensation. That is the tradeoff for being underpaid as a teacher. Retired teachers don’t screw anyone… folks who don’t want to pay higher taxes to match the increase in cost of living are who is screwing folks. Down with Prop 13! Thank you for reporting this. This will be a long fight. I appreciate the passion Misty feels towards our children. Many of my friends come from teacher families and I know they worked hard for their students and their schools. They went into teaching knowing they would never become rich but because they cared about education. I feel deeply sad when I read comments about teachers not caring about our young people but money. There are many jobs in San Francisco that pay much more with less stress for people that often hold multiple higher level degrees yet the teachers of San Francisco (and I daresay everywhere) still work hard doing the best they can. I also know that charter schools, like KIPP, choose not to educate students who are learning English or receive Special Education services and therefore do not test those students. Public Schools teach all students. I have heard that KIPP will kick out students around February to avoid testing low-testing students. These students then are tested under in public schools. The tests do not take this in account. There is more to the achievement gap then these tests.